A super speedy canapé, appetiser etc for you today! 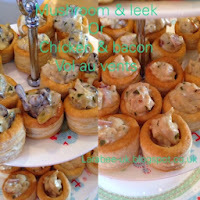 These quick and easy vol au vents can be put together in minutes, are tasty and look great, win, win, win in my book! 1. Cook the chicken breast at 180oC for 25 mins until no longer pink, meanwhile fry off the bacon, remove from pan and cut into tiny pieces using kitchen scissors, leave the oil in the pan. 2. Heat olive oil in a pan and gently fry the mushrooms and leeks. 3. Fry the shallot in the bacon oil. When chicken is cooked, cut into tiny pieces and add to the pan along with bacon, pour in the stock and cream and add the tarragon, simmer for a few minutes, if sauce is too thick add a little water or more stock. 4. Cook vol au vent cases according to instructions. 5. When mushrooms and leeks are soft, add stock, cream and tarragon, again if it seems to thick, loosen with a little water or stock. 6. When cases are ready split the case, fill with the mixture and serve! Can be kept in a cool place until needed. These look so simple! It had never actually occurred to me what goes inside of vol au vents! Thanks for linking up with #WeekendBlogHop, happy new year! Hi Vicky, happy new year!